New York, October 30, 2010 – The delegation of Kosovar businesses led by the American Chamber of Commerce in Kosovo in the United States of American visited New York as well where they met with representatives of business associations, entrepreneurship and innovation organizations, and individual businesses in this country. The delegation of businesses from Kosovo led by AmCham Executive Director, Arian Zeka, and accompanied by the Consul General of the Republic of Kosovo in New York, Teuta Sahatqija, met with Yvonne Bendinger-Rothschild, Executive Director of the European American Chamber of Commerce in New York. The discussion was focused on the progress Kosovo has made in the aspect of doing business as well as with the requests that Kosovar businesses have for U. S. investors, whereas Bendinger-Rothschild pledged to support Kosovar companies in this direction, including finding business partners. 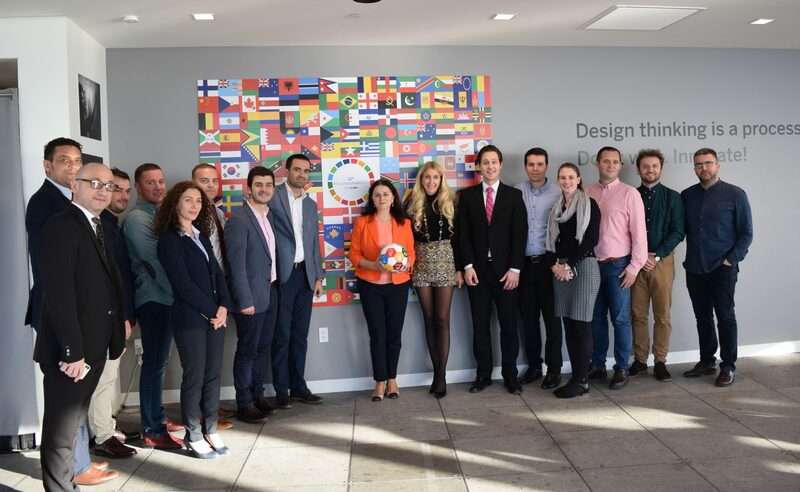 With the support of the Consulate General of the Republic of Kosovo, the delegation also visited the SAP Next Generation organization in New York which leads the innovation and entrepreneurship program that engages on implementing the United Nations Sustainable Development Goals. The delegation was hosted by the Vice President Ann Rosenberg who mentioned the hard work in this center in stimulating innovation. She declared her support in developing a similar program in Kosovo as well. The Consulate General of the Republic of Kosovo also organized a reception for businesses from Kosovo that come from various sectors such as manufacturing, trade, consultancy services for businesses, information and technology services, as well as Albanian professionals and entrepreneurs that are members of the Albanian Professionals and Entrepreneurs Network in New York. This event was a good opportunity in networking and experience exchange between Kosovar entrepreneurs and Albanian professionals in America. The delegation visited Bronx also where they were hosted by Dren Deva, owner of TV Alb, a company which provides television services in USA. Deva informed Kosovar businesses for their future plans which include the establishment of a distribution and retail company that would focus primarily on importing products from Kosovo.